It’s been dry. Last decent soaking rain was over 2 months back. EE is getting on quite comfortably with her walking aid, now dubbed “Dolly the Trolley”. So she said, that we might take a trip down to the You Yangs, and have a walk on some of the tracks around the carpark. Sounded good, but its dry, very dry. So I didn’t have much hope of finding many birds. Suitably loaded with morning tea and a banana smoothie, and securing Dolly into the boot of the car, we set out. And what a fine morning the weather had put on. No wind and an enjoyable warm sunshine. We arrived at the carpark at Big Rock and Dolly immediately sprang into action. 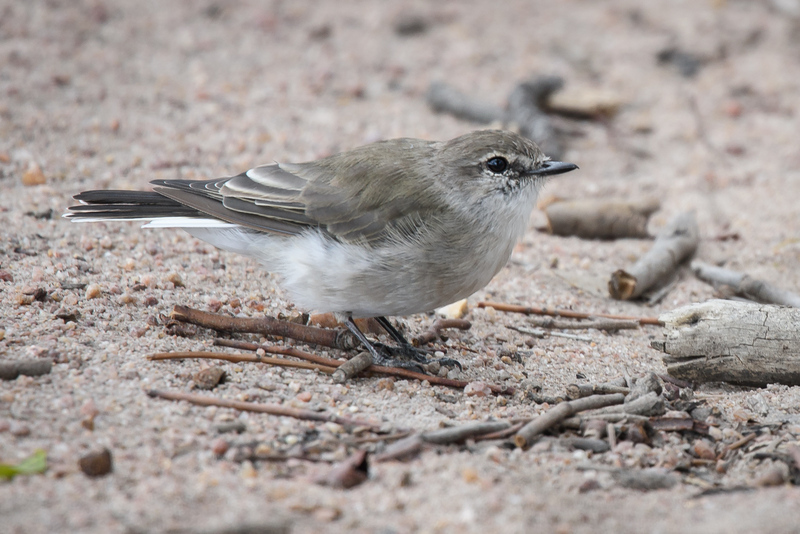 First sighting was a Nankeen Kestrel, then a Brown Goshawk, and two families of White-winged Choughs. 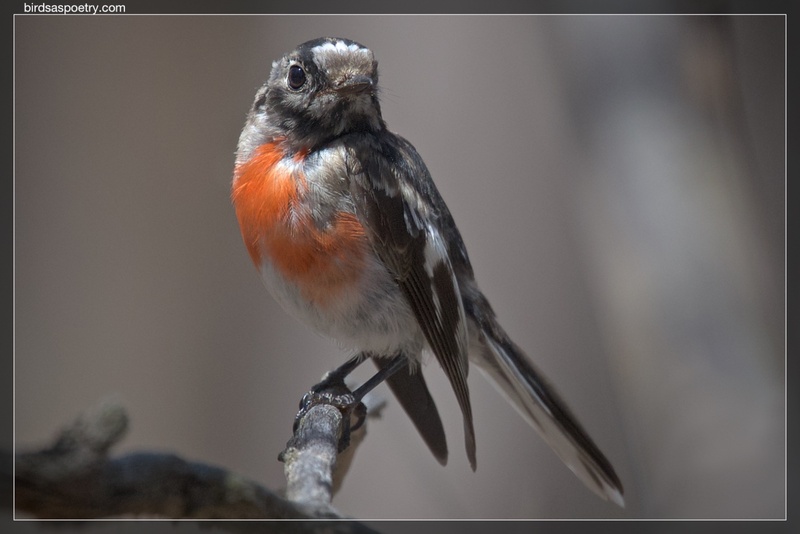 And to my amazement, the Scarlet Robin pair that normally are in residence. Off to a good start. Dolly is good about this, as EE can go to a spot, and instead of having to stand or sit awkwardly on a log or stone, Dolly is ready and willing. So a comfortably seated EE is a happy EE. They must be able to smell it. Or hear the tinkle tinkle of it dropping. But within a few minutes, she had quite a mixed flock on hand. Only problem that the water was only good for a couple of minutes. Which is when I arrived. Now, we’ve seen the pipe dozens, if not hundreds of times, and never taken a lot of notice. But from the location, I figured it was the run-off from the handbasin at the toilet block. Let’s see. Hold down the tap, let a couple of litres of water run down and go see. Slowly a tiny trickle of water appeared, and then a stream. And before you could say, “What a waste of Water!!! 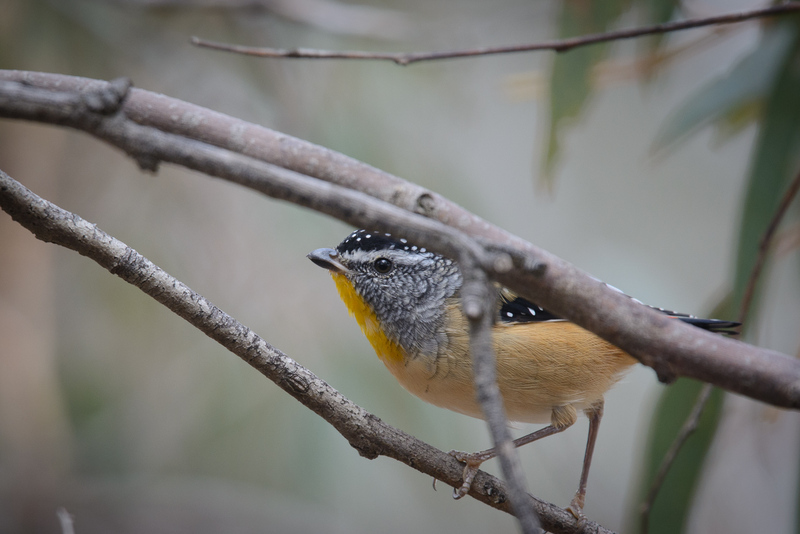 !”, we had flocks of Red-browed Finches, Spotted Pardalotes, New Holland Honeyeaters, Silvereyes, White-naped and Yellow-faced Honeyeaters, a few familes of Superb Fairywrens, Brown Thornbills, Red Wattlebirds, and two bossy Magpies. Then to top it off both Scarlet Robins made a quick appearance. So, we sat, occasionally egressing to push some more water down the pipeline, and drank a cuppa, enjoyed the fun, and felt pretty happy that they were able to enjoy such a precious commodity. 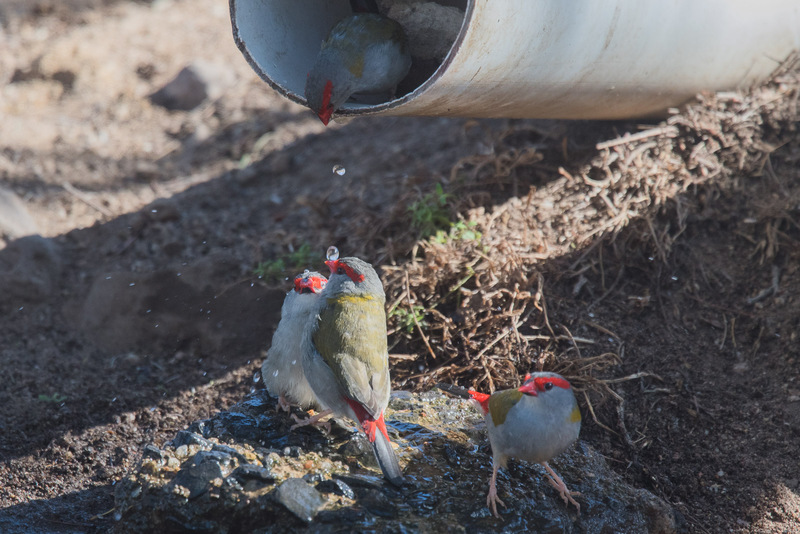 When a few Crimson Rosellas came by to inspect, we thought we were made. But the Rosellas didn’t stay. 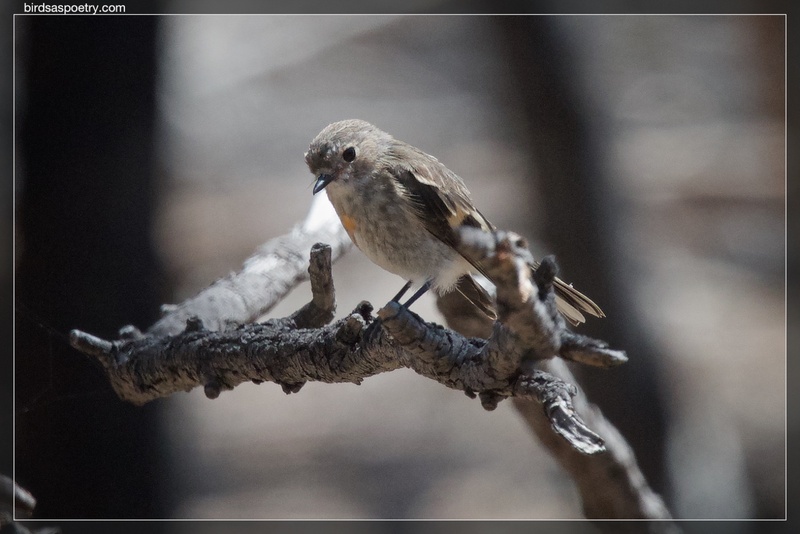 Likewise a passing Grey Fantail, but being photographed was not on its todo list. Satisfied with a morning’s work, and two memory cards bulging with images, it was time to leave. I gave the tap a run for an extra minute or so and didn’t feel the least stressed about ‘wasting’ water. The birds were more than happy. We loaded EE and Dolly back in the car and went for a well-earned coffee at Gary’s at the local servo. 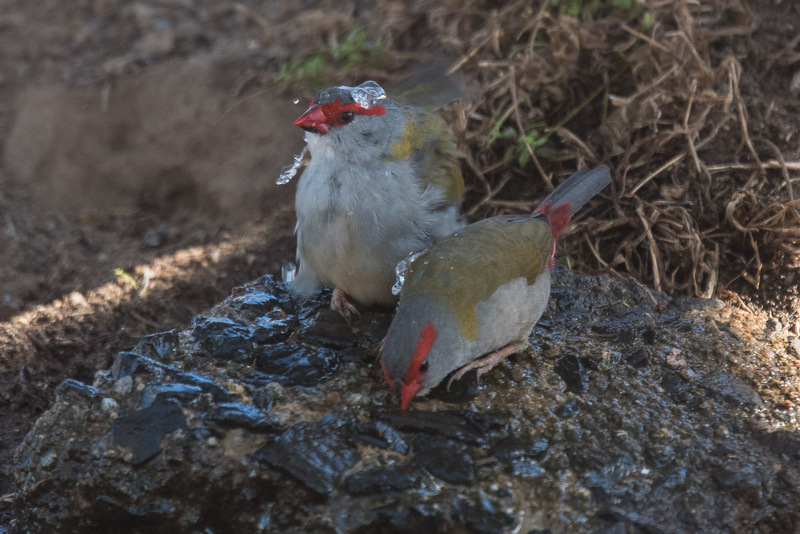 The Red-browed Finches seemed to enjoy the water running over them. 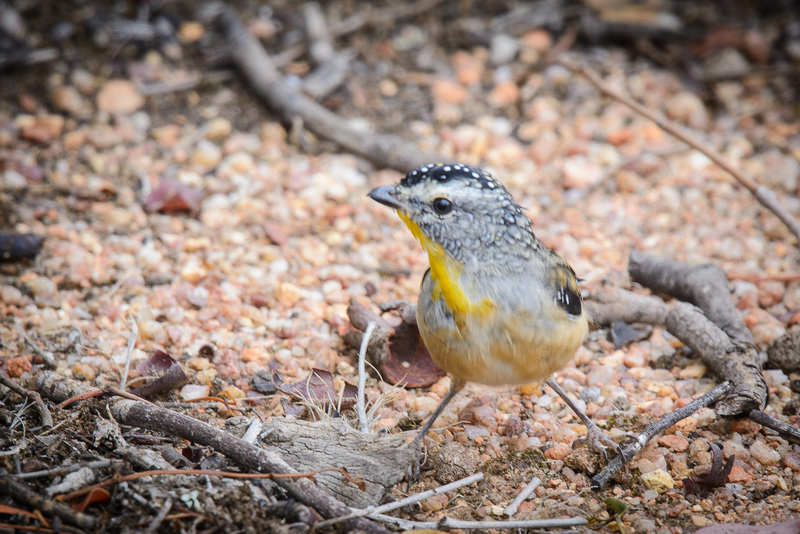 A Striated Pardalote watching the bathing. 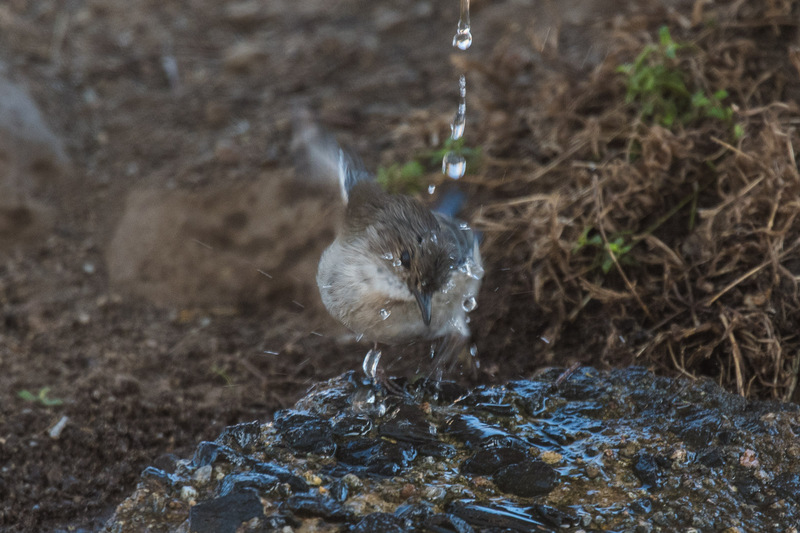 Interestingly the wrens seemed to be able to time the droplets and catch them in midair, just like insects I suppose. This one was taking advantage of the stream. 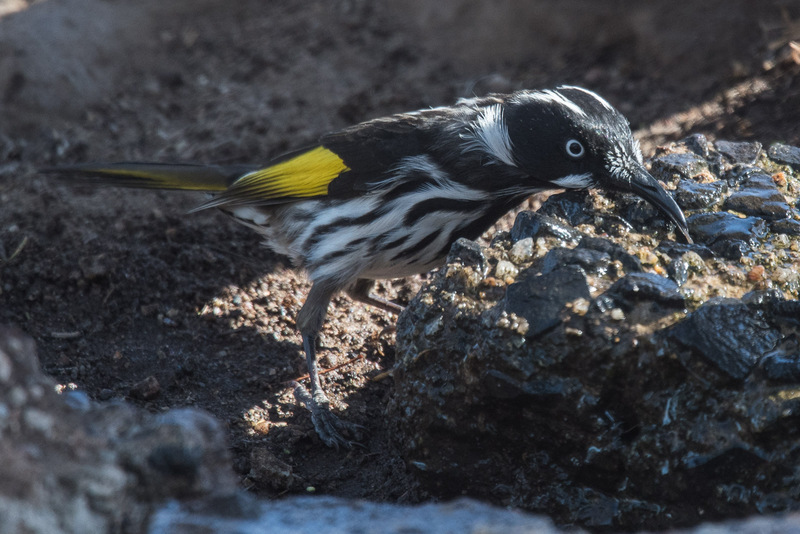 One of several White-naped Honeyeaters. This is how you enjoy the water. Anytime you add water and New Hollands, you get the inevitable and rowdy discussion about whose turn is it next. When the Magpies showed up, everybody else took off. 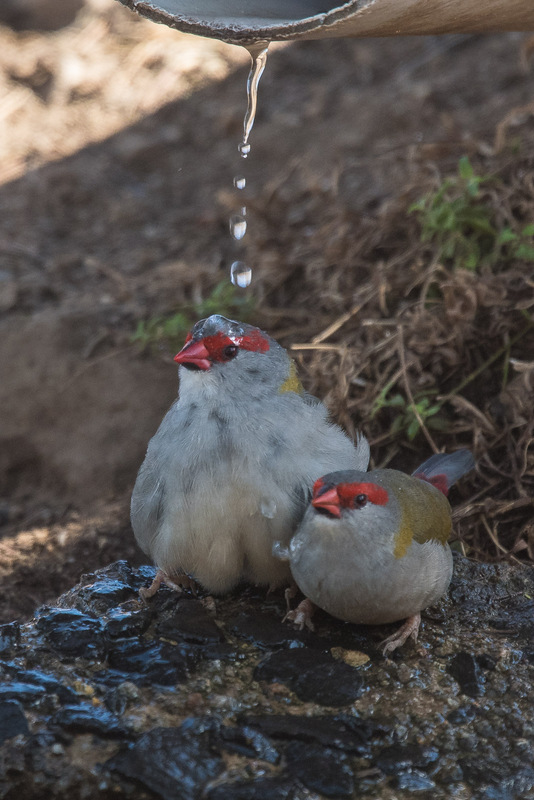 Oh, oh, please, just one more drop, one more drop. It was one of those mornings when I looked out the window when I got out of bed and it looked clear. No Wind. Bonus. Didn’t take long to work out what to do. Check again, just in case. Yep, no sun up yet. Crisp twinkling stars set against a perfect black velvet setting. Good to be alive. Mind, most of the apprehension of the morning was based on dire predictions of Noahic proportion winds and rain from the weather prognosticators on the telly the previous evening. But most times they leave me amazed at the amount of descriptive words that can be used to create fear and despair among the masses, when it comes to describing the following day’s weather. We’d been sitting quietly for awhile. Infact long enough to enjoy at least one cuppa and think longingly for the Thermos for a second. It’s the You Yangs. Near the old, now unused, Duckponds School building. 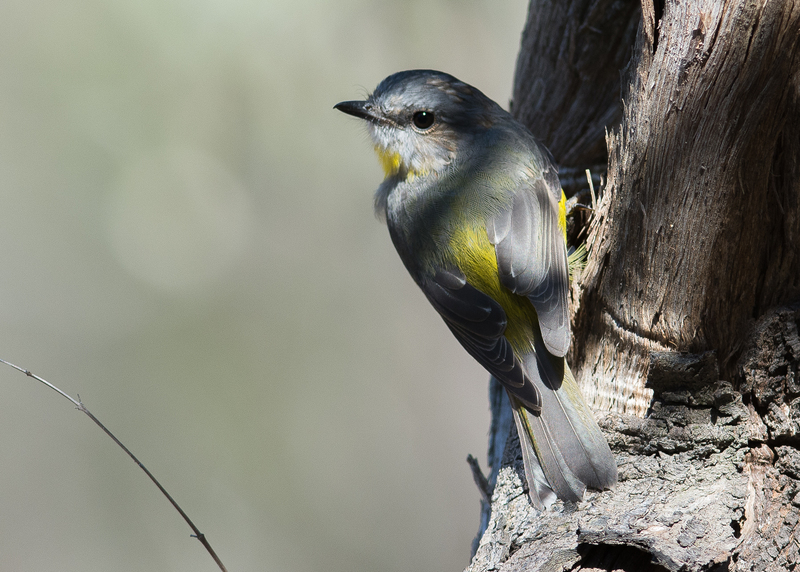 We were making one last session at finding the Jacky Winter pair and to see what the Eastern Yellow Robins were up to. To tell all the truth. Not much. Yep, that’s it. Little, a void, devoid, uninhabited. Departed, moved on, relocated. And its been like that for quite awhiles. Many of the more productive spots we’ve been visiting, have been, well, decidedly UNproductive. I knew there were White-winged Choughs on the other side of the main road, as their calls were quite clear. When I was a mere broth of a photographer, and knee deep in learning the craft, one of the big studio swings was away from formal portraits in a studio and more to ‘environmental portraits’, as they became known. I’ve blogged on this process here before and over on Studio Werkz, and the studio I was working with, at the time, was quite slow in making the ‘customer’ perceived change and ‘that mob’ down the road with their shiny new Hasselblads made the running. Yet the young-gun in me was always eager to explore new opportunities. And like hand-coloured black and white photos, the old studio portrait gave way to the more ‘exciting and involving’ outdoor portrait. As much of my own direction turned to product photography the need to embrace the new age really didn’t catch me. After all who wants to see their precious white-porcelain bathroom bowl posed against some tree/plant/water feature or industrial backdrop. Yet, I have to be among the first to acknowledge, the chance to use the power of the ‘around’ and the available light has always given me a real pleasure when I get to do the occasional, informal portrait. 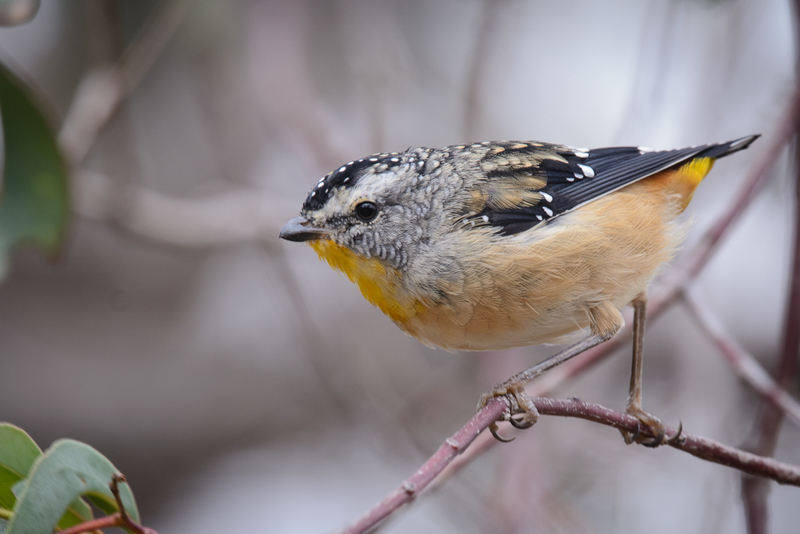 I’ve been contemplating my own bird photography of late, and while I enjoy the camaraderie of the Flickr page tis a tough medium to encapsulate the images that go into making a story of the birds. 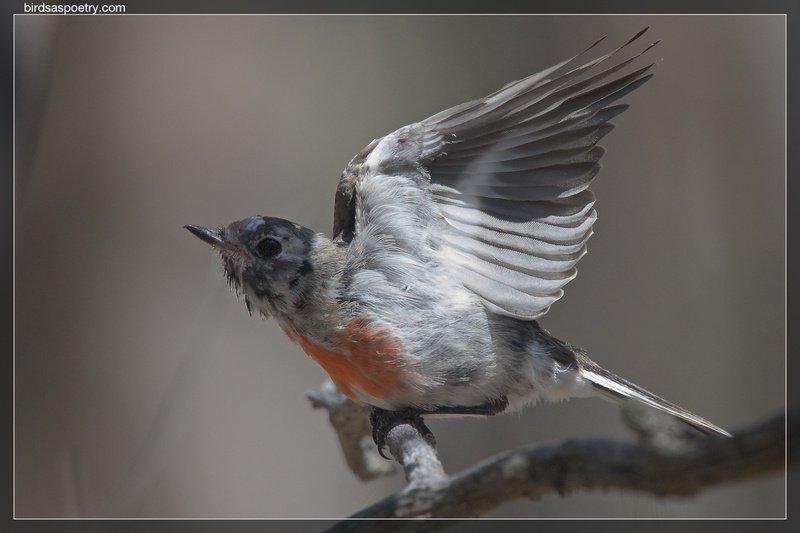 Long time readers will recall the earliest blogs here were much more the sharing of time with a bird or pair or family as it seemed to me to bring the story of their important lives. So, I have considered combining Studio Werks into BirdasPoetry, and share the challenges of the craft of portrait stories. 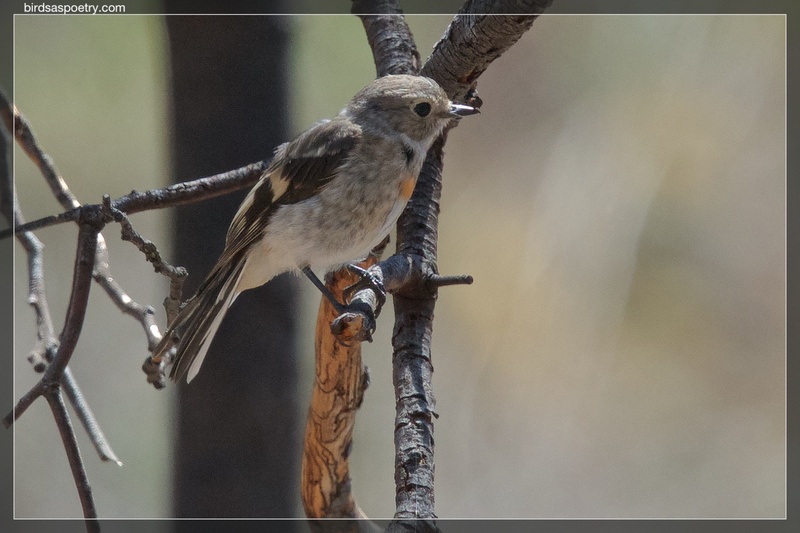 Which of course takes us directly into the field and in this case a sunny morn at the You Yangs. And almost before we had the cameras out of the car, the shrill, Zhhhhht, Zhhhhht, Zhhhht. Pling pling pling, of a Restless Flycatcher rang in our ears. The Clancy Koala Foundation, was holding a Clancy Mini Tour to celebrate Clancy’s birthday. Clancy is a koala at the You Yangs Regional Park, and he was born and raised there, now in his seventh year he has also now a father to a young son. Always good for a party we went down to the You Yangs for the Clancy Mini Walkabout. A chance to learn a bit about the work of those attending to the welfare of the Koalas in the park, (there are as many 100 or more so we were told), and to help by pulling up a bit of boneseed, the invasive plant that has endangered the habitat of the koalas. Not only do they need the right trees to munch on, but space on the ground to move about, and the tall, thick, dense boneseed destroys that space. What a good idea saith I, we could go to the party, and before hand we could take a wander about a couple of areas and look for some Robins. Donchathink? And EE and Mr Anonymous agreed. You, Leave my Babies ALONE! Went to visit the Jacky Nursery last evening. Both parents are busy looking after the two fledglings, now ensconced in separate trees. 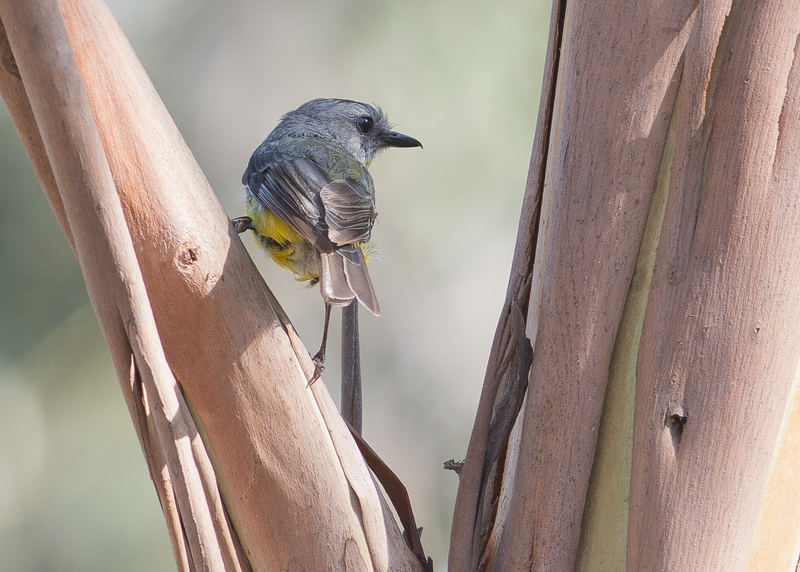 One little dude had chosen to fly in and land in a tree that White-plumed Honeyeaters consider “their territory”. 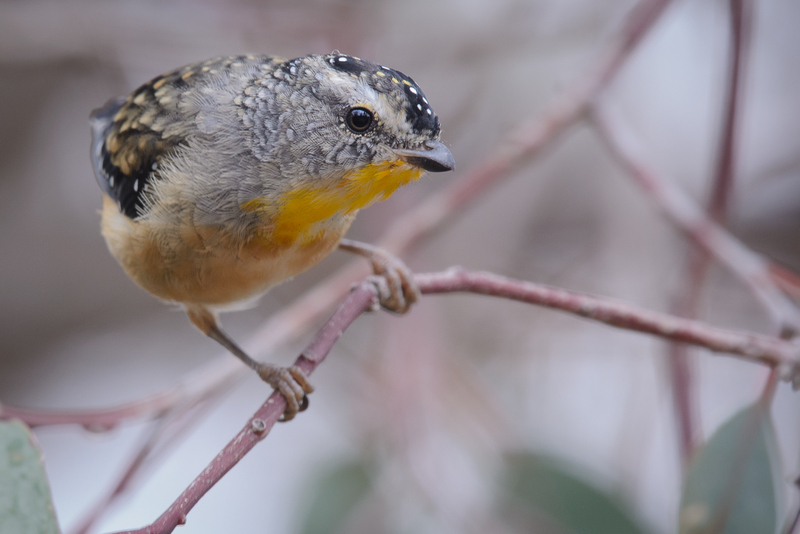 I’ve made the statement before that Jacky Winter are birds that have stolen my heart. They are not the most startling of colour, nor do they seem to have a particular outstanding feature that makes them a special bird. They used to carry the unfortunate name, “Lesser Fascinating Bird”, so that should be a hint as to how we’ve seen them in the past. They have a pleasant nature, and don’ t seemed too fussed by us humans. And once they have id’d us, they seem to settle into tolerance bordering on disdain. 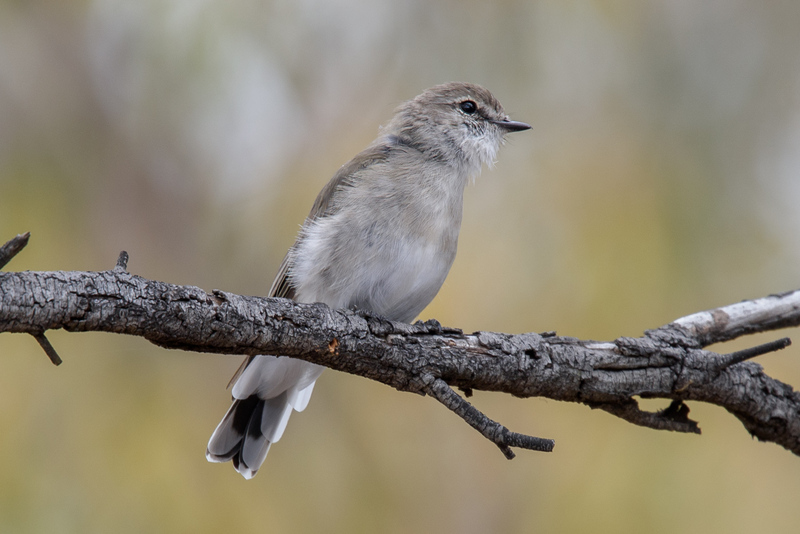 We were in the You Yangs some weeks back and it was casually mentioned, “Oh, I saw a Jacky Winter down near the old school building”, as in— well that ticked Lesser Fascinating Bird off my list, have you seen anything important? It was enough to make me stop on the way out and scout around. 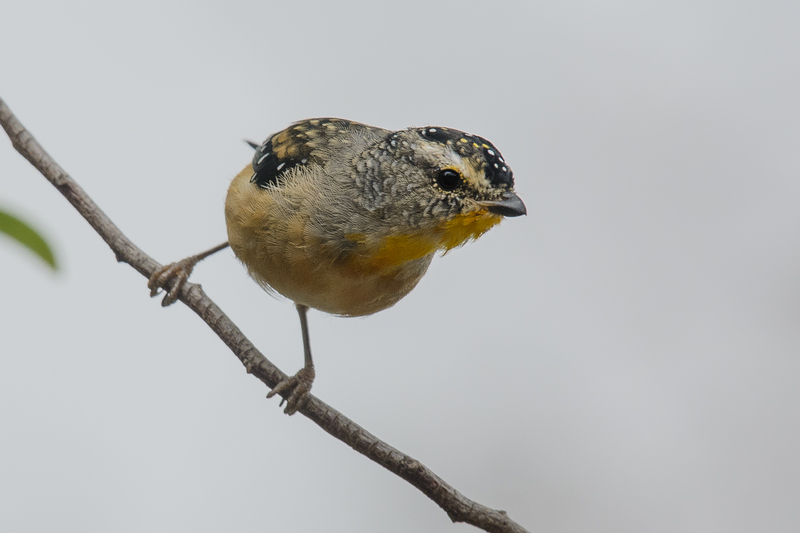 Spotted Pardalote. The bird of rumour and voice. Mostly we never see them. Hidden among the topmost leaves, their tiny call recognisable, but impossible sometimes to locate. 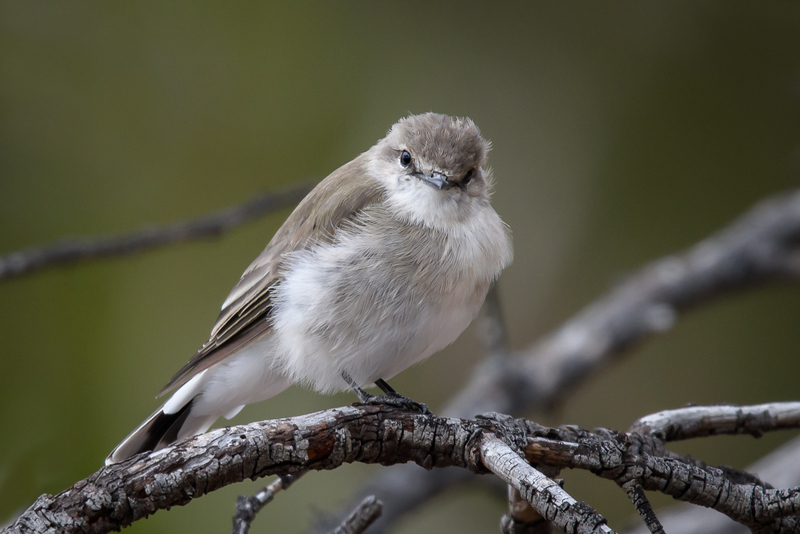 To nest, they descend to the earth, dig an incredible tunnel — up to 60cm or more and setup house for the 3 weeks it takes to lay, incubate, hatch and fledge their young. Those of us who walk the earth with them will often find evidence of their nesting activity. So I suppose do all sorts of feral predators. Yet, each year they disard their cloak of invisibility and take to the task. Once complete, its back to the treetops and small tiny peeps that discolose their presence. 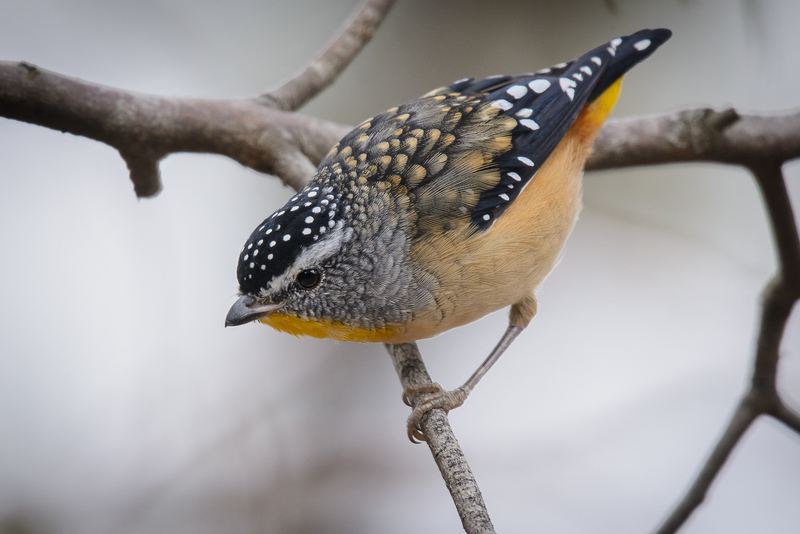 They are one of our smallest birds. I’ve handled a dead one, (hit by a bicyle — the bird didn’t even know what happened, and the rider was oblivious —. I picked it up, still warm, it fitted into the very centre of the palm of my hand, my thumb twice as large as the bird. I took it to the side of the road, opened up a small hole in the earth and laid it ever-so-gently down. The warm earth welcomed its little wonder. They are so prefectly marked. Rich black, white, deep orange yellow. Tiny legs that seem like rubber bands as they can stretch and seem to bend to any angle. 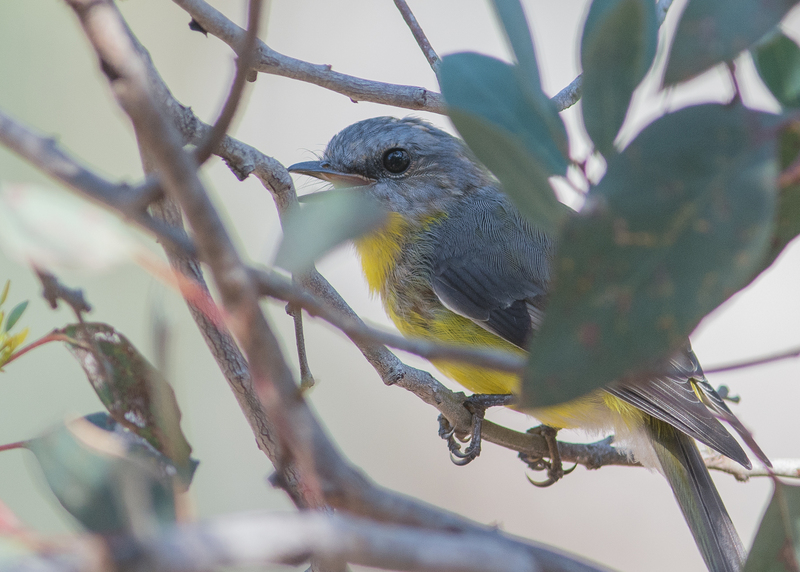 While EE was spending time with ‘her’ Juvenile Eastern Yellow Robin — it is now growing to be quite the impressive adult, keeping only just a hint of its juvenile brown feather set now — I looked to see what else was in the area. 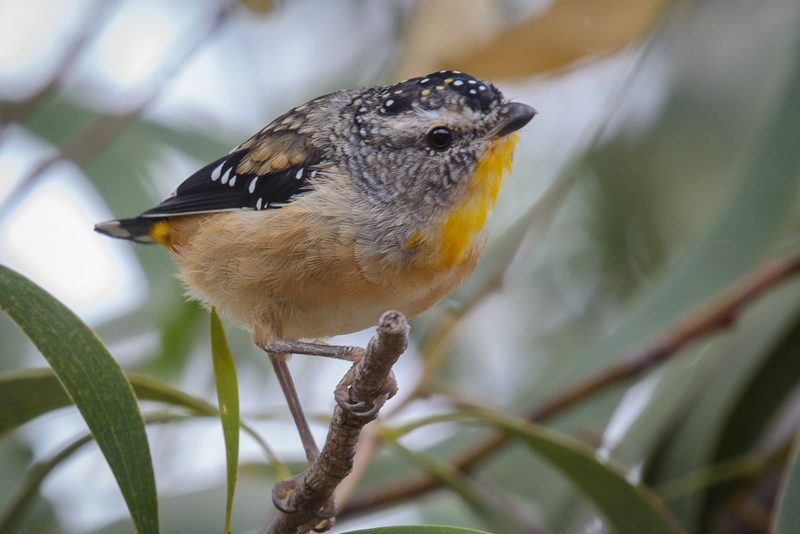 A small family of Spotted Pardalote were feeding among some of the smaller gums in the area, and were happy to work in the lower branches while I followed their progress. Peek-a-boo. 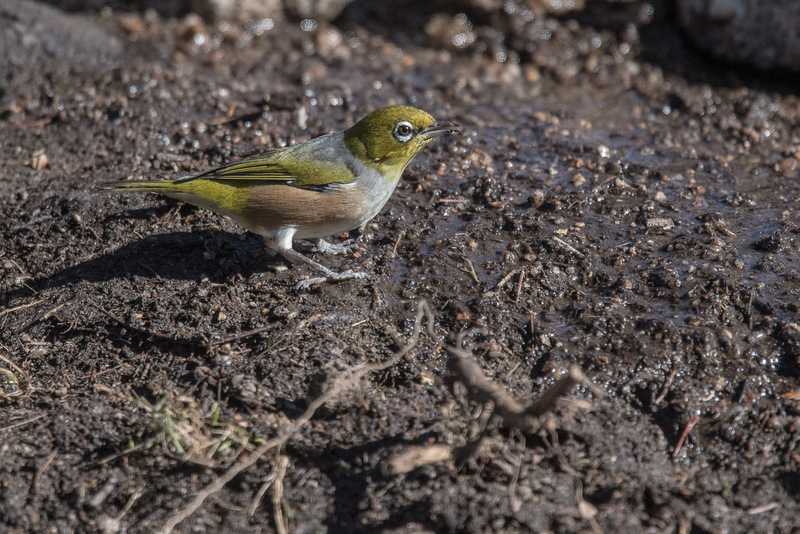 Not often easy to find these lovely little birds in the open. What ever the attraction its part of that white substance. What ever it was eating fell to the ground and it made a quick trip to pick it up. 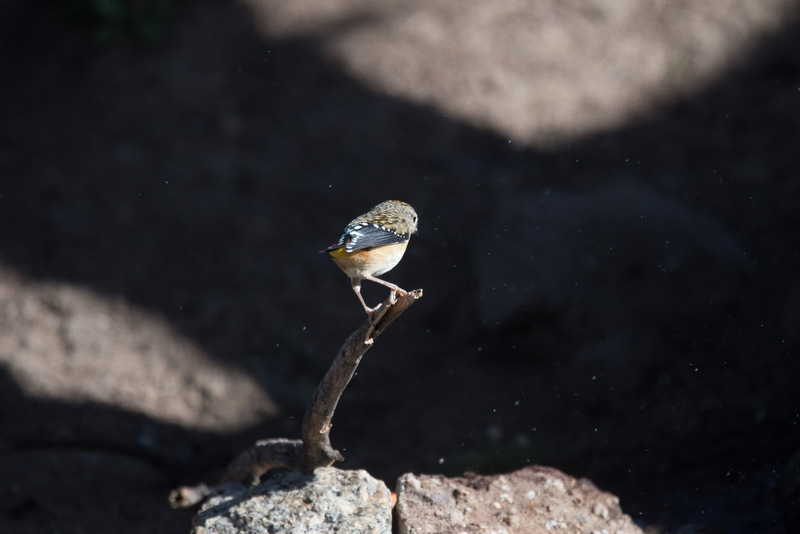 Those amazing little legs seem to able to adapt to any angle. As enigmatic as ever, they were gone. I love Jacky Winter. There. I’ve said it. Now you know. 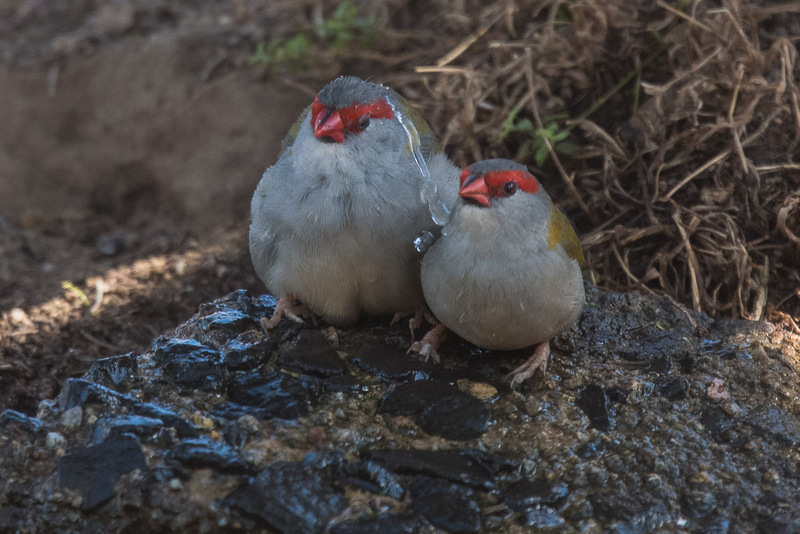 There is something about these little birds that just resonates with me. They are not the most brilliantly dressed, they don’t seem to perform mighty deeds, and they have a fairly limited song routine. They have a charming and endearing gentleness and unhurried approach, that just fascinates me. Jacky hunts robin like by sitting quietly then pouncing on prey on the ground. 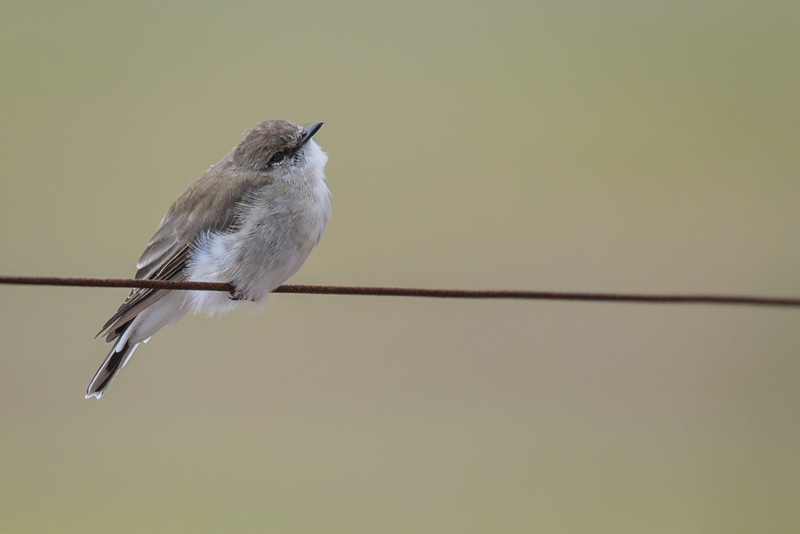 I’ve talked this over with several pairs of Jacky Winter, as to why they should be called ‘lesser’, but on each occasion, the little bird’s reaction has been to glaze over its little eyes and settle in to the perch without further concern. So I figured they don’t care what they are called. 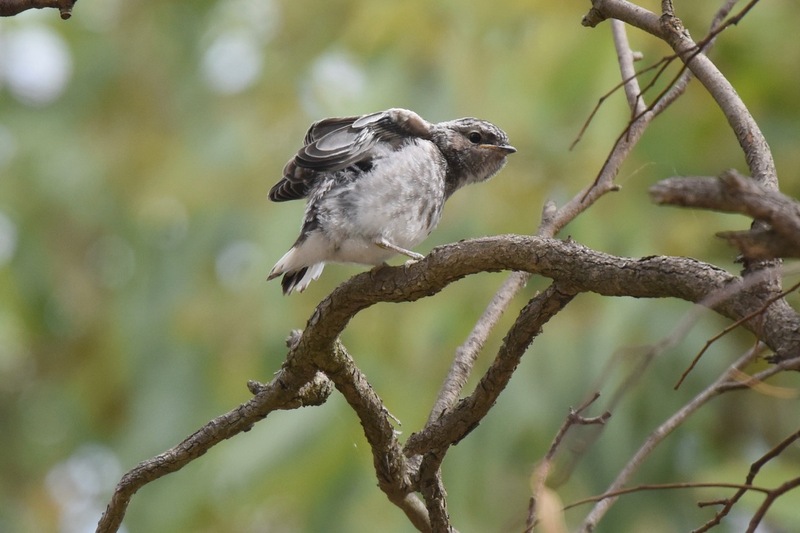 Jacky also has a somewhat predictable habit of landing on a perch and then wagging its tail back and forth, (think Willie Wagtail, Grey Fantail). They also seem to perch down on the branch resting their tummy on the branch. 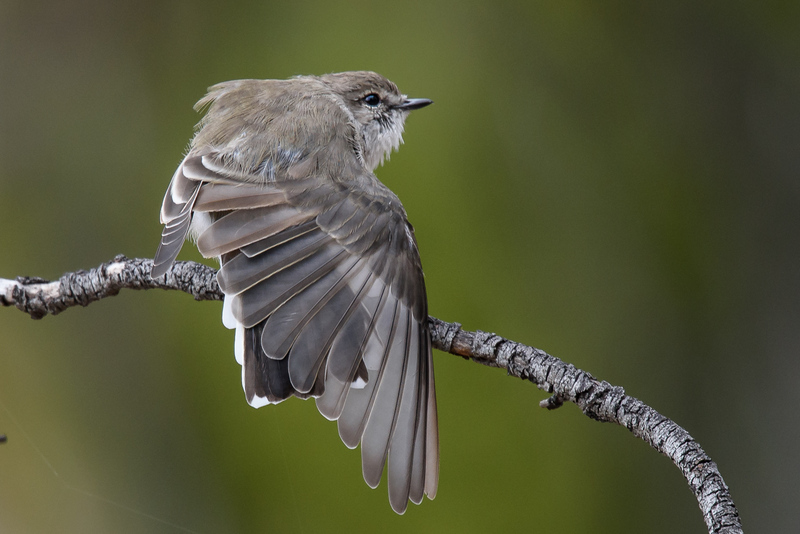 Jacky’s tail edge is white, and it makes quite a show as it lands and then flicks back and forth. 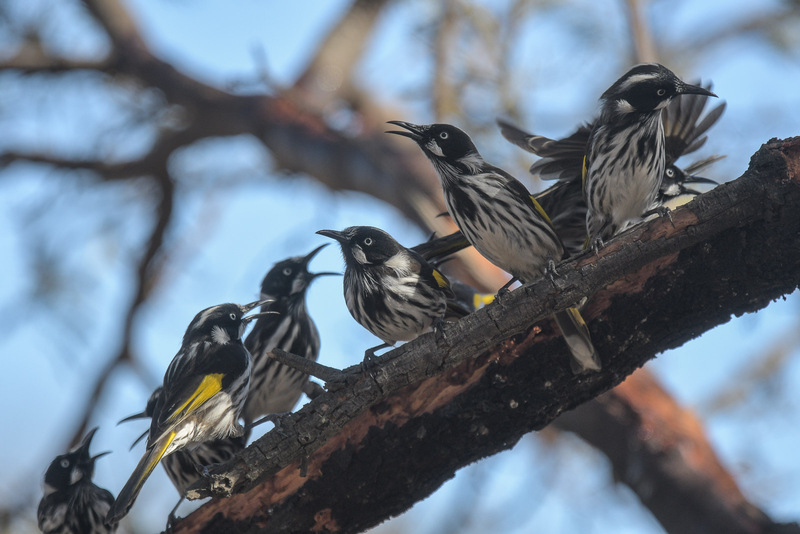 It’s most melodic tone is a somewhat plain “peter, peter, peter” And it has been reported to be among the very first to herald the dawn chorus. A second chitter is much more a scolding call, and Mr An Onymous loves to remind me of the day we were working with a pair and after 20 minutes or so, Jacky had reached its limit. And I got a really severe lecture, and no further pictures for the day. Truth be told. EE and I were on a mission. We wanted to locate a pair of Scarlet Robins. They are locals to the area and he has featured in the blog before, long suffering reader that you are, you might just remember the shots of him attacking the ‘bird in the car’ reflection at the carpark! 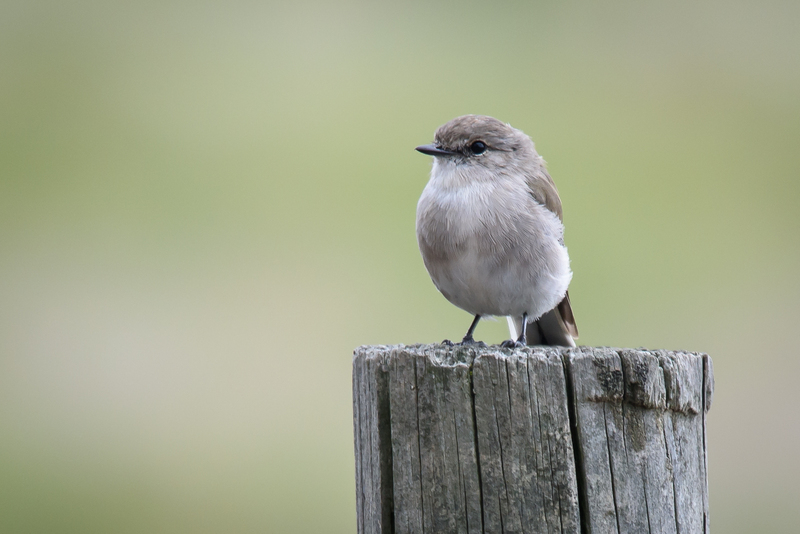 We’d not seen much of them this season, and at least one nest had not been successful, nor had we seen any evidence of new birds in the area. As we searched, we came to a opening in the forest near the track, and two Jacky Winter were hard at work. At first they were if nothing, disdainful, at having intruders. But it only took a minute of so to settle and A little bit of patient sitting and both birds were happy to provide various poses. 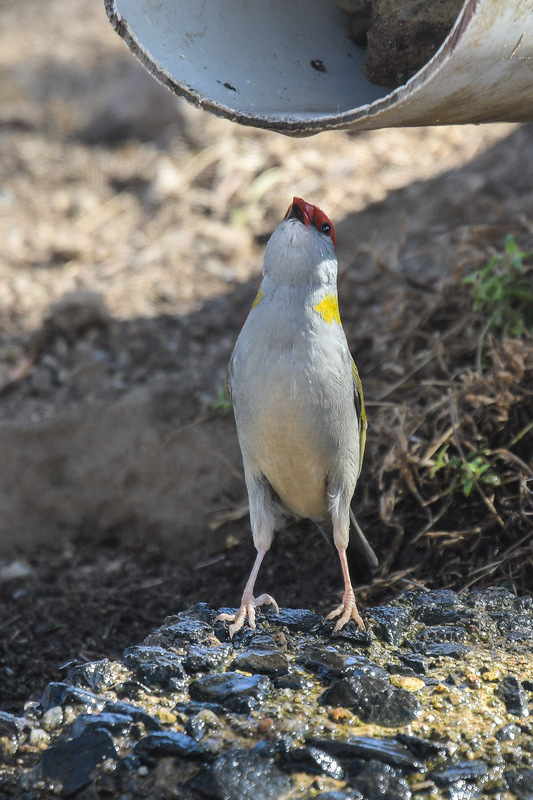 Then one of those great ‘rites of passage’ moments, and Jacky flew by me, circled about and landed about a metre away. The gracious little bird had accepted me. And then I was able to learn of the ways of the Lesser Fascinating Bird. It hunted on the roadway near my feet, looped up to catch insects and chatted away quietly to the second bird. I know I talk a lot here about Jon Young’s approach, and sometimes it seems fanciful about the bird’s acceptance of my presence. As we were working on a branch about 2m from the track, a dog was being walked down the track. Instant alert from Jacky 1 and response from Jacky 2. 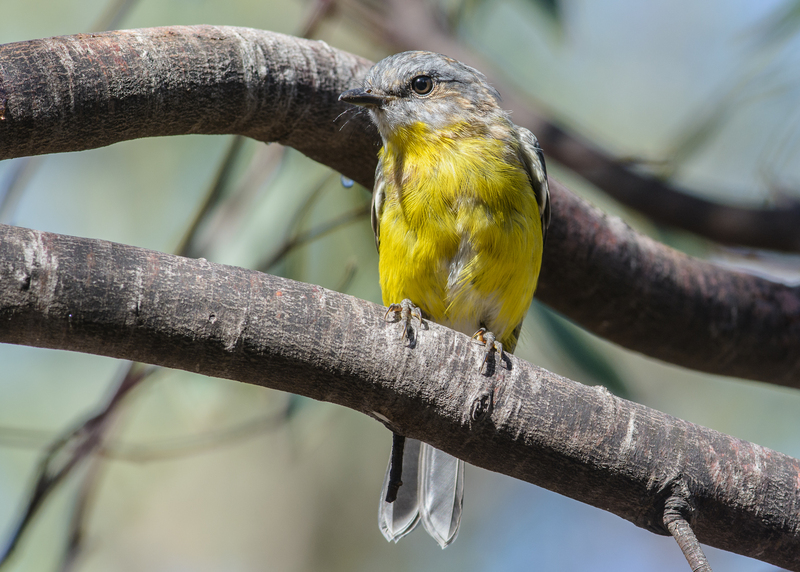 And remember this happened with the bird on a branch about 3 m from my position. Yep, I’m up here in the branches. Is it coming off the track? It’s passing by now, are you safe? Yep, I’ve that silly human photographer in front of me., I’ll be alright. 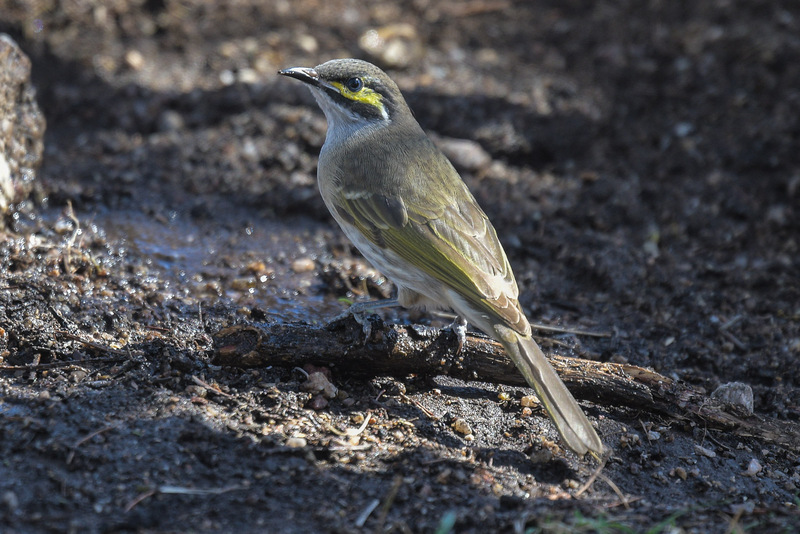 Jacky watched the dog go up the track about 50m or so before it dropped its head and continued on with hunting. Fanciful. Of course. But, what ever happened, the Jacky was on high alert for the dog and completely comfortable with my presence. Oh, and we eventually found the Scarlet pair. But. That’s another story. How to make any ordinary post look extraordinary. Put a Lesser Fascinating Bird on it. A model with a thousand poses. What a about a nice chat? On Dog Alert. It watched the dog come by, and kept it in sight until it was well up the track. 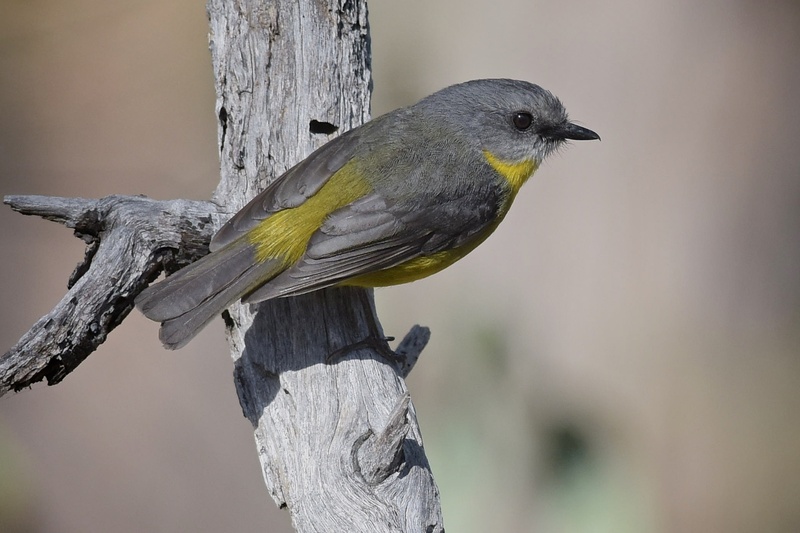 We have, EE and I been following a pair of nesting Eastern Yellow Robins at the You Yangs since she began about late October to settle in to nesting. 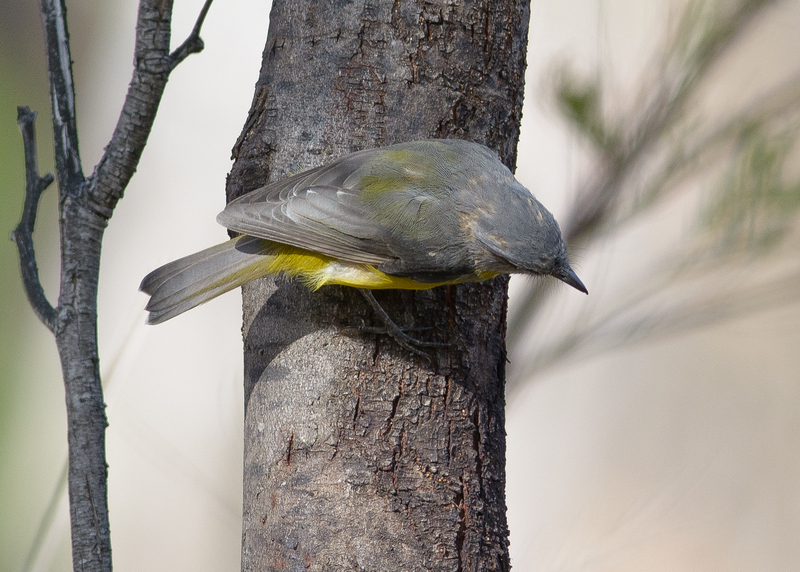 Because EE has been working with them pretty closely, I’ve really tried not to get in the way, as the raising of an Eastern Yellow Robin is fraught with complications and doesn’t need people trampling all over the nursery. For the uninitiated, Mum sits on the nest, Dad feeds, and after about 3 weeks the egg(s) hatch. Then a feeding frenzy gets the little one(s) to a point of being able to move but not quite fly. They then flutter down from the nest. 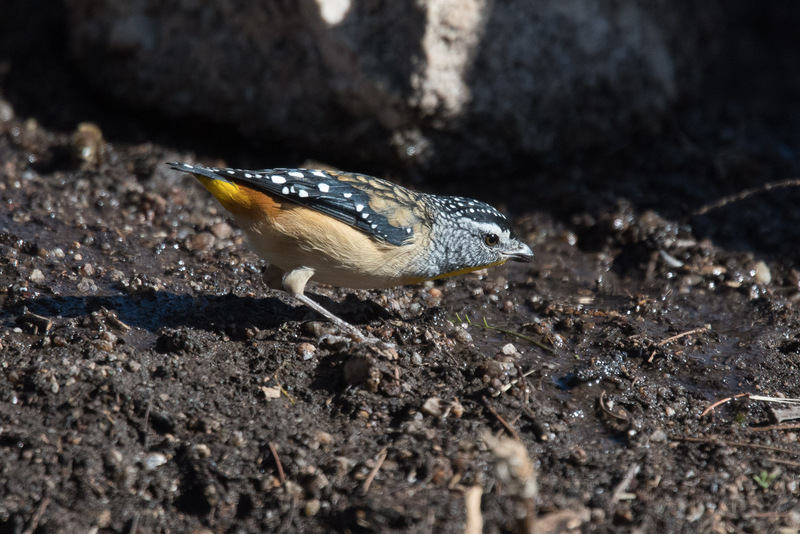 Once into the leaf litter or small shrubs, they stay pretty much stationery unless really disturbed, and then the best they can do is to hop or jump away. Flight of any real significance doesn’t happen for 3-4 weeks. They have two survival strategies. One: remain absolutely still. No matter what. And I’ve seen them for up to 15 minutes or more, sitting in the leaf litter and not a move is made. It can be barely possible to see them breathing. Two: A brilliantly designed brown and creamy chevron dress makes them almost impossible to see amongst the litter. Just ask someone who has located one, and then tries to explain to someone else. “There, by the small stick, under that overhanging branch, with the dark green leaves. Oh, better yet, look from just here, bend down, see, just there behind that pale grey leaf.” Oh. Forget it. About the only way is when an adult flies in with a food parcel. Then, “Oh, over there, you didn’t tell me that!” See first paragraph about not getting in the way for more details. Mum and Dad, (This is one of the few pairs we’ve never struck names for, as we really can’t distinguish one from the other), have been working so well with EE, and occasionally I’ve been allowed a glimpse of the young one – they only seem to have succeeded in bringing one up. But now that the young one is nearly moulted out of the brown and chevron, and is a fully developed flyer, and is able to fend for itself, things have changed a bit. And today, I got a few minutes where it came to visit me and see what I might be doing. 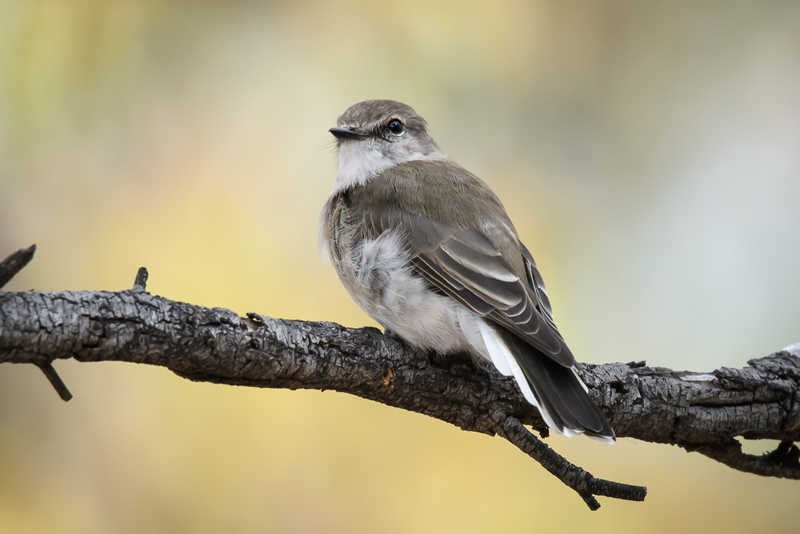 During that time, it also put itself into a secluded area behind some leaves and I think it practised its singing calls. It has the Robin contact call and what appears to be the warning call down pretty well, but the sharp distinct “PhTew’ call of the adults is still a ways off. So it sat among the leaves and seemed to run through the process of calling. A bit garbled, so more praccy needed I suspect. Here are a few from the morning’s portraits. Most all of the brown is gone and the distinctive grey yellow is showing through. New week, new assignment. The “ABOUT ME” page. Frankly, I’m pretty much over who “Me” is. I have really wanted to be transparent on the blog and let the photos and words be the heroes and carry the story. The pictures and words on each story are much more important to me, than ‘selling’ myself. In the end, if nothing else, the images I make and the stories I write honour the subjects, that will in be sufficient for me. Thinking about the About page made me realise, at least to my own satisfaction, that in the end, I’d just publish here because I’d like to share some of those small moments we experience with the birds. I hope you enjoy it as much as we do. Building Connections, the San Bushman culture. Jon Young has quite a bit to say about the relationship of the San Bushmen and their land. A keen awareness that is virtually impossible for them not to acquire or at least appreciate an understanding of the bird’s perspective. – See there it is the “about me”. Recently found a wonderful book about the author, Elyne Mitchell, who wrote a series of children’s books titled The Silver Brumby, great kids read, and pretty nice for adults to chill out on too. She had a delicious way of describing the horses, their land and their activities. I bought EE a copy of the book, because in some ways it reflects, how I’ve been able to watch her photography, and her interaction making connections over the past few years blossom and mature. See her Flickr site Friendsintheair to see what I mean. I wonder how many of us had read at least one of The Silver Brumby series. We’ve walked the high country EE, I and our small children, summer after summer, autumn and spring. You will of course note not much mention of Winter in that sentence. Seen the horses run, (Yeah, I know, I know, spare me the lecture on muddied wildflower beds, damaged winter grasses – enjoy the horses) and it’s all part of building connections. 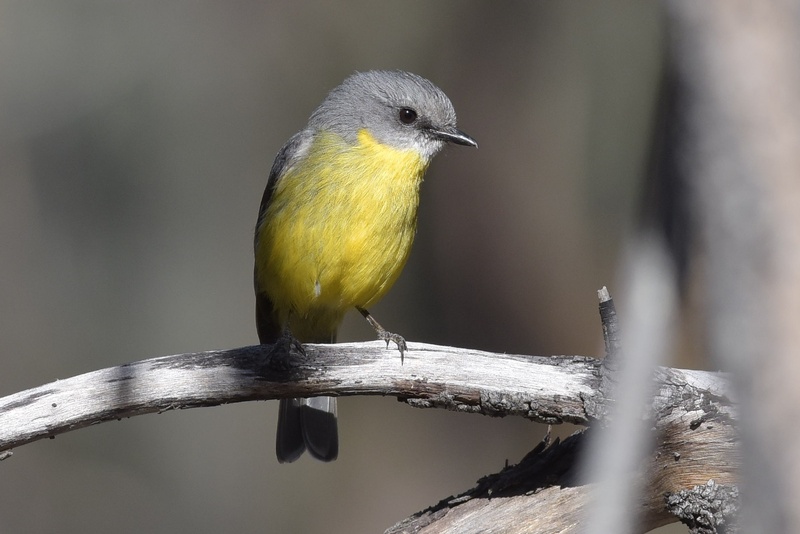 EE has taken to building relationship with a pair of Eastern Yellow Robins at the You Yangs. They are, as you’ll be aware, right in the middle of bringing up their young one. This relationship stuff is a one person thing. So I’ve been glad to sit back and let her work with the pair. 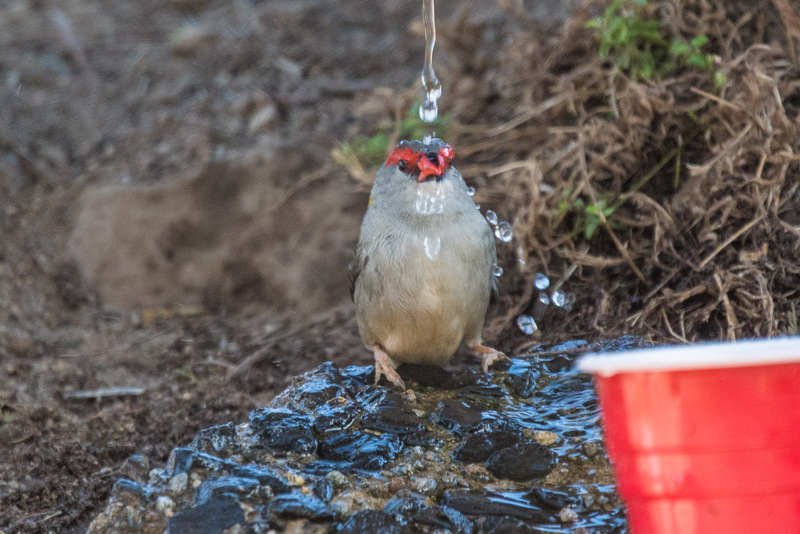 I take shots as the birds give me permission. So here is a few portraits from recents sessions. And that is what Birds as Poetry, is about. Didn’t need an “About” page after all eh? 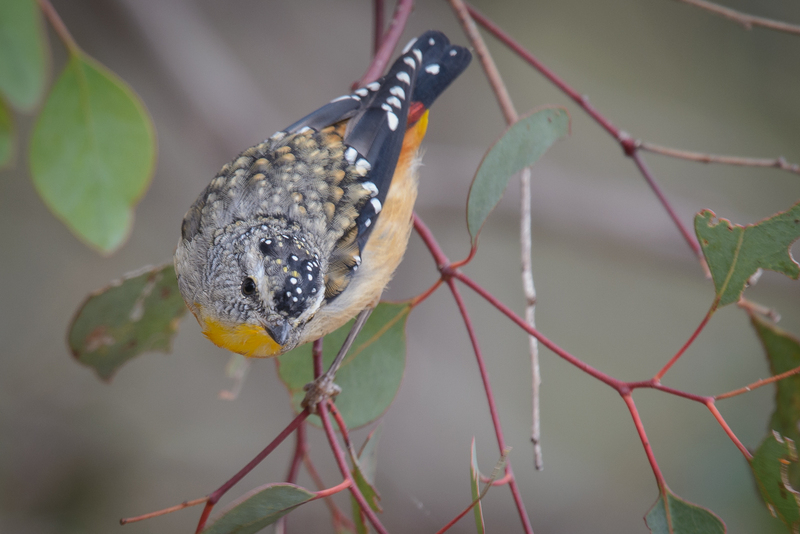 In the You Yangs, looking for Red-capped Robins. What we did find is this handsome (?) 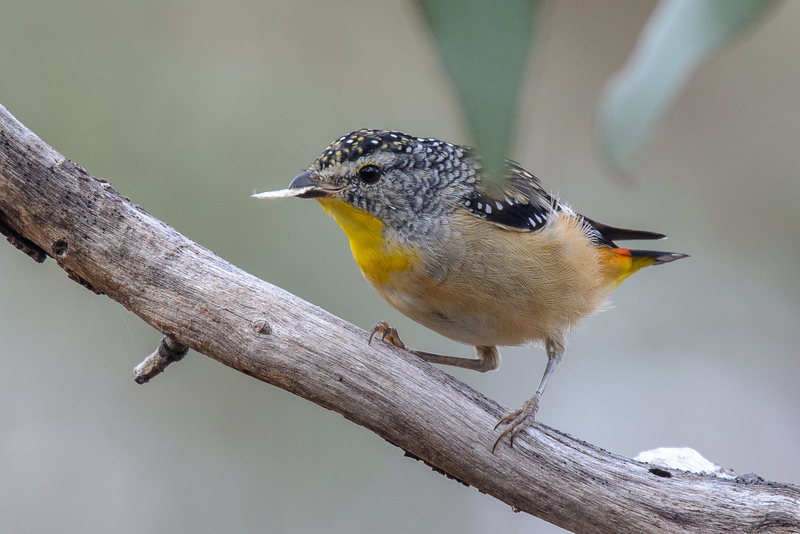 young male just moulting out of his juvenile feathers and into his marvellous Male Adult feathers. Long, long term readers may well recall, but you don’t lose points for not recalling that a number of years back I encountered another young male at Woodlands who subsequently stayed on, and became quite the dominate male in the area. 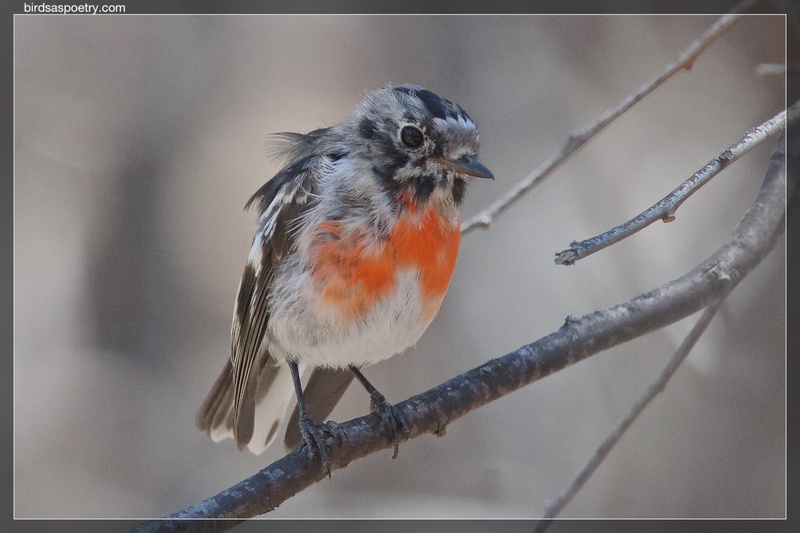 See here, Scarlet Robin, female? 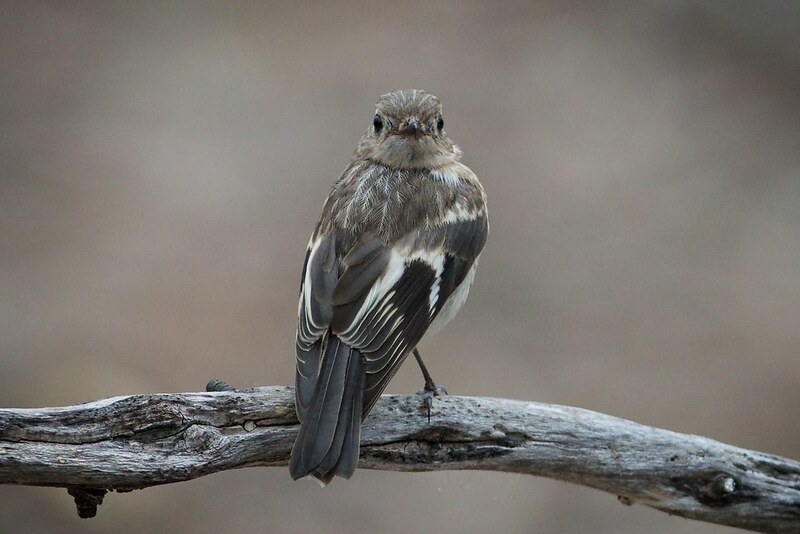 I also featured this new bird about 4 weeks back when we came across it earlier in the season. The shot is over on Flickr. So here he is in all his resplendant dress. Well perhaps not so much at the moment, but given a few more weeks, and he’ll be the best looking bird. His consort. I am not sure if its a sibling, or in fact a female that he is wooing. They were together about4 weeks back, so it might be they are related. We shall see. All the colours are starting to give the right indications. Another view of the consort. She seems to keep up a constant chatter with him. Today, dear Reader, it’s all about…. You! Well at least that is what the assignment says. And as this is not for profit, not political, not competitive, and essentially about the birds, the process of audience profile, identification, and finding the niche in the market, leaves me just a bit blah, and pretty much over Blogging 101. Still its always nice to be prompted to look at things from another perspective. Keeps us fresh. 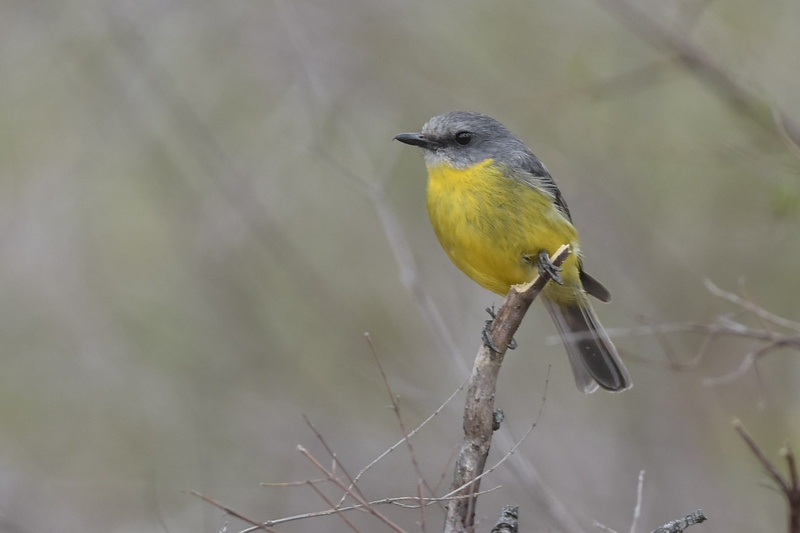 We, EE and I, have been working for several months now, with a delightful pair of Eastern Yellow Robins as they accept the challenge of adding their little bit to the gene pool. As EE has adopted this pair, I’ve been a bit reluctant to pursue them as well. 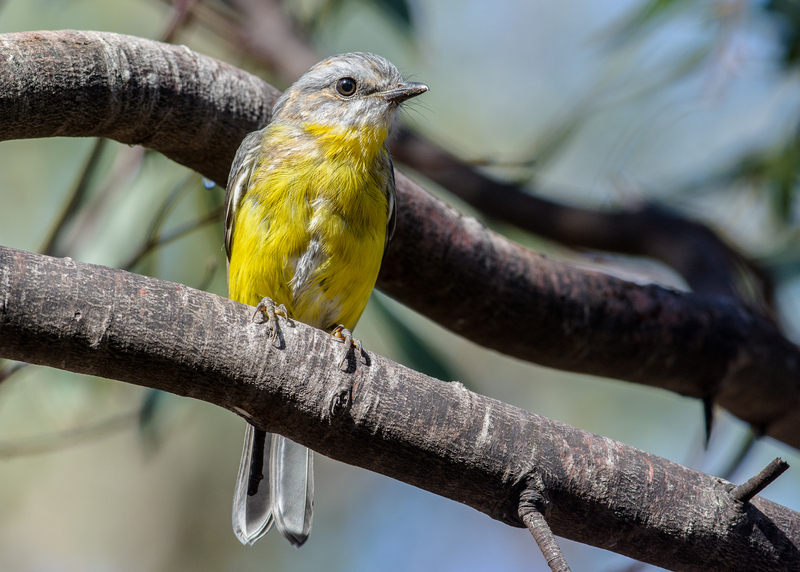 Figuring that parenting a young Eastern Yellow Robin is difficult enough. 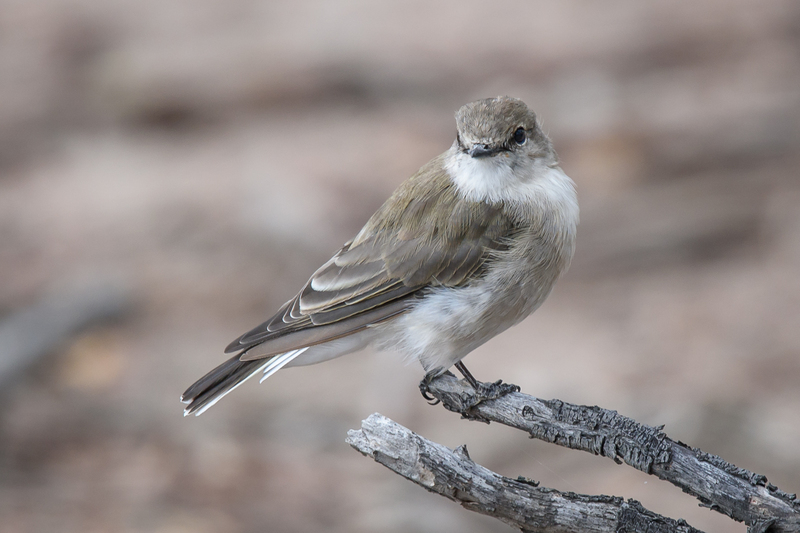 For the un-initiated, she sits on the eggs for around two weeks, then they feed the young, (usually two, but this pair had one) for about two weeks. 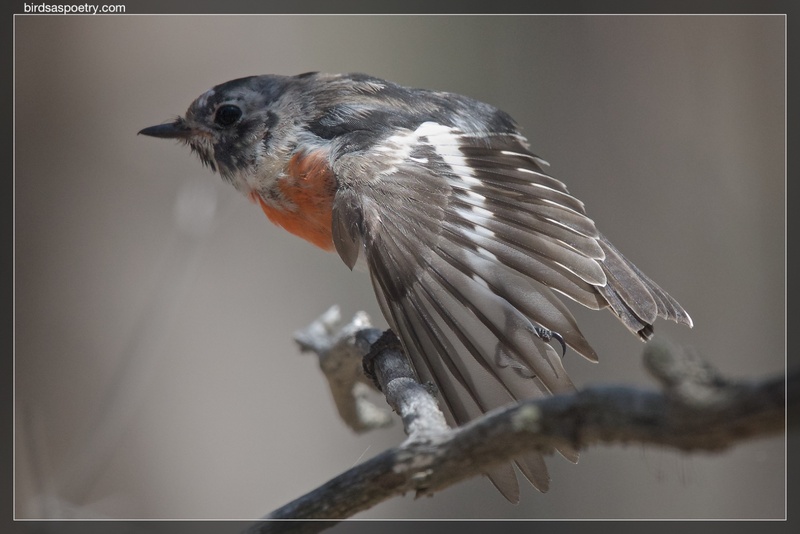 Then it jumps from the nest, flutters to the ground and spend the next 3-4 weeks hiding in the leaflitter. Barely able to fly as it has no real flight feathers at this stage, it must surely be among some of the most vulnerable of birds. But, the process works. So, finding this well disguised and cleverly marked tiny bird is typical needle in haystack stuff. See point above about awareness and you’ll begin to grasp what goes on at the location. Not that we are chasing the bird. Far from it. Sometimes I really just want to know where it is, so we don’t inadvertently stand on it. Or more probably flush it to a new location. Bad for it, stressful for the parents, and against my work ethic. See border box. 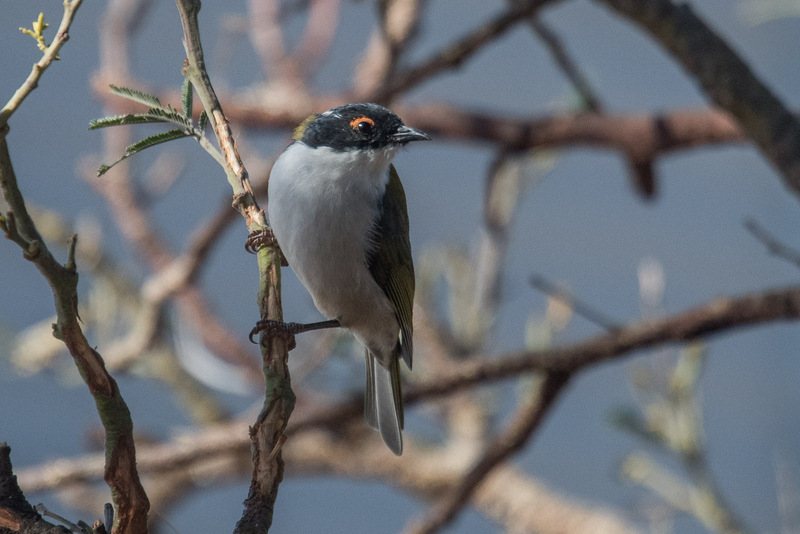 We have pretty much been unable to distinguish the female from the male, so really not much point, as Jack Sparrow (should be a Cap’n in there somewhere) says, Naming fingers and pointing names. 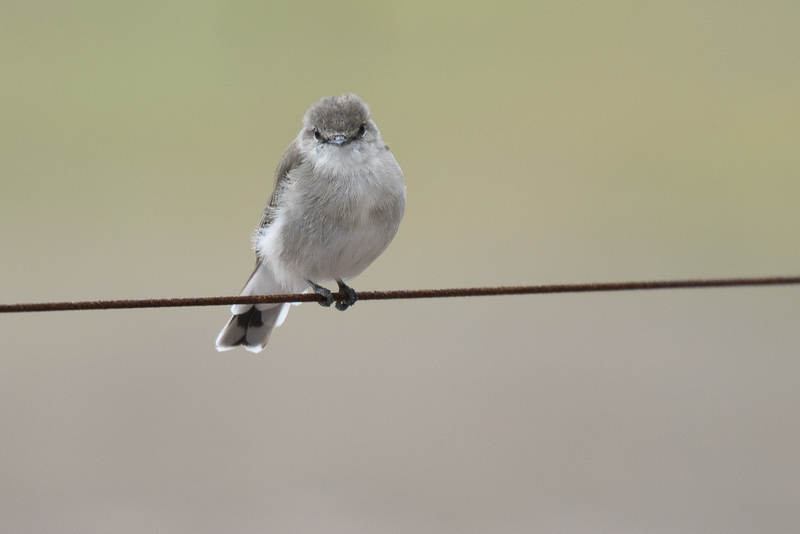 Now as the young bird is much more mobile, it has become somewhat easier to sit, wait and opportunistically, it will fly by and sit. And it did. I knew where it was pretty much from the moment we got off the track and into the scrub. See point on Awareness above. How? Well let’s just say Mum told me. 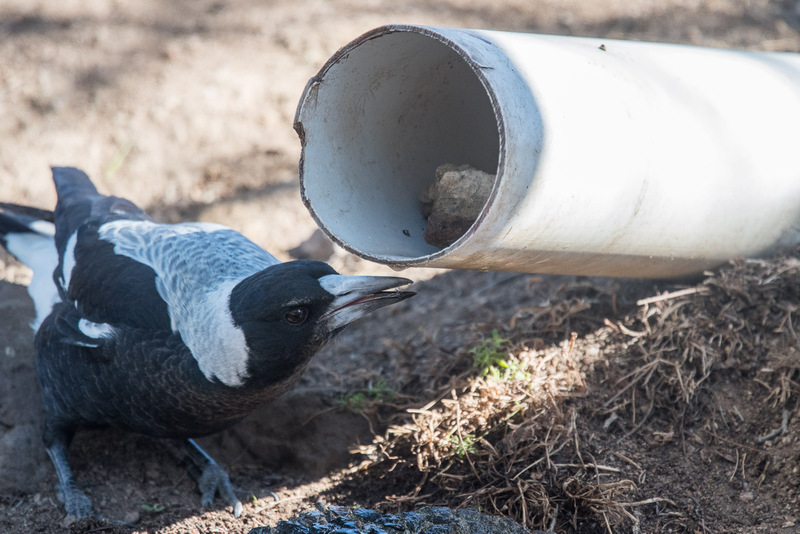 After bringing it down for us to admire, and then feeding it a great big grub, she decided that was sufficient activity for the moment and a big sleep would do wonders for the little bird. After much body language, and a really interesting ‘fluffed up’ head, the little dude took off the the undergrowth for a sleep. And this is where I reckon it gets really interesting. Not just anywhere out of sight and hidden, but in the bush next to where I’d been sitting. The distance measured by the camera through the bushes to the little dude is less than 4 metres. It snuggled up on a branch with Dad (?) nearby and Mum (?) on guard on a tree directly above. Point is, I’m still having the hair on the back of my neck stand up about it. The choice was hers to sit in that close to me. I didn’t move. Jon Young calls it a Rite of Passage, in a world in which “Connection” has to do with the strength of your mobile fone signals; sitting still for the sacred and connected moments brings dramatic benefits. A full-contact nature sport! 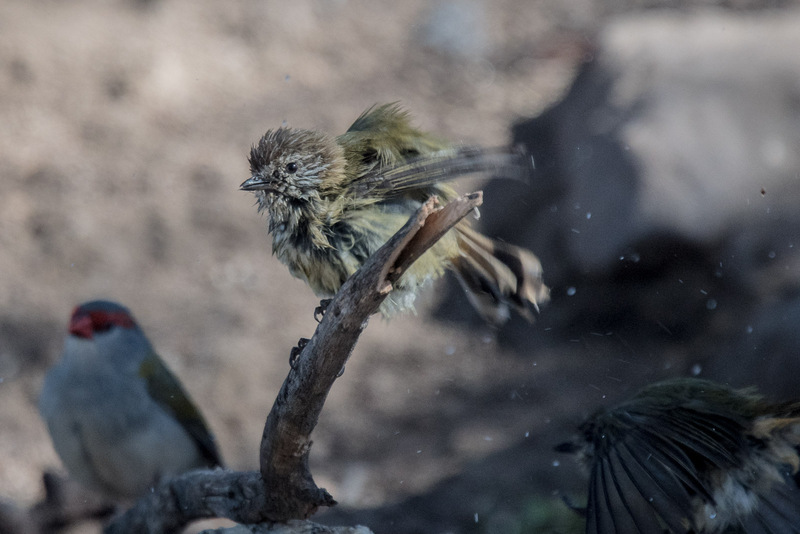 The chest and side Chevron markings of babyhood are well gone and coming through the brown are the distinguishing yellow feathers. Completely at home now, on the wing. Strong and direct flight. Hey, food. I’m up here. Time for a sleep my little one. 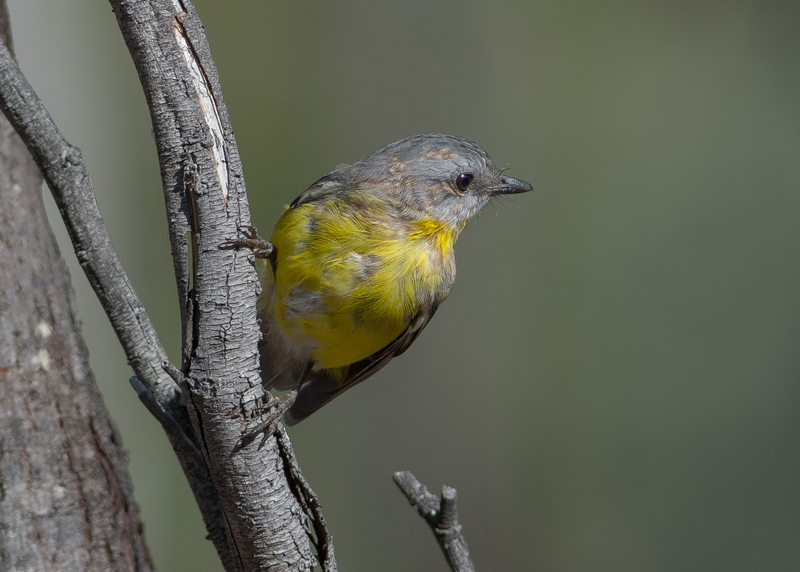 Mum has a fluffed out head, and while not visible hear a flicking tail. Mum?’s fluffed up head and tail flicking were a signal to move on. The selected sleeping spot, with (Dad?) to sit with.